Michelle Meikle is a Breeze Champion who qualified as a Level 3 Bikeability National Standards Instructor through Breeze. Michelle rides in the Chesterfield area. I'm a utility cyclist – I use my bike to get from A to B. I do have a car but cycling's my main method of transport. I work in learning support at Chesterfield College and cycle there and back. I'm lucky because I live quite close to work and the shops so it's my preferred of getting around – it also saves petrol and keeps me fit. In fact I'm noticing that I'm putting on a bit of weight during the holidays while I'm not at work! As well as doing the free Breeze rides, I also do cycle training. 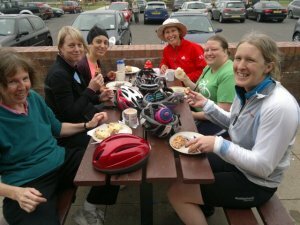 I love teaching ladies who've never cycled or haven't been on a bike for several years. That's who my Breeze rides are aimed at – someone who's thinking of digging the bike out of the garage, who's perhaps not ridden for 20 years and can barely remember how to turn the pedals. It's great to build their confidence. Several ladies have seen my ride advertised and, for whatever reason, don't feel comfortable going out on their own. Each time they gain more confidence. Recently, I had a brilliant email from lady to explain why she wasn't coming on my rides anymore. It wasn't because she had dropped out, but because she had gone on to bigger and better things! Breeze rides help build confidence. If you've already got a bike in the garage but you're worried about sorting your chain out or getting your tyres pumped up, the first thing I'd say is to get in touch with someone from Breeze. If we can't do it, we'll know someone who can. We have a great network of contacts - there is someone who can help you take that first step to help you get on your way. If you don't have your own bike, then on lots of rides there's the option of hiring a bike. I was a late starter – I didn't really start cycling regularly until I was 40. When I was a child, my mum was too scared to let us out on roads because of traffic, then at university my bike got stolen so it wasn't really until I had my own kids that I got a bike, so I could go out with them. I'm an outdoorsy person. I love walking in the Peak and I like being outside. I like hooking my trailer on and going shopping - I felt it was good for my mental health rather than going to shops in the car. You can mix in exercise and getting a bit of fresh air. We're lucky where we live – there are little back ways so you can stay away from traffic where possible. That said, now I'm a BikeAbility instructor I know how to position myself safely on the road, but I often build in the extra time to go the back way if I need to go shopping. Cycling ticks so many boxes – it's good for the environment – you can be an eco-warrior. It also helps you engage with kids because you can cycle together, it saves petrol and it helps you get fit. 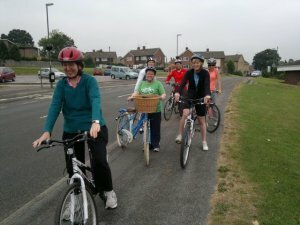 Another wonderful thing about Breeze is that us older ladies can come to cycling a bit later in life.